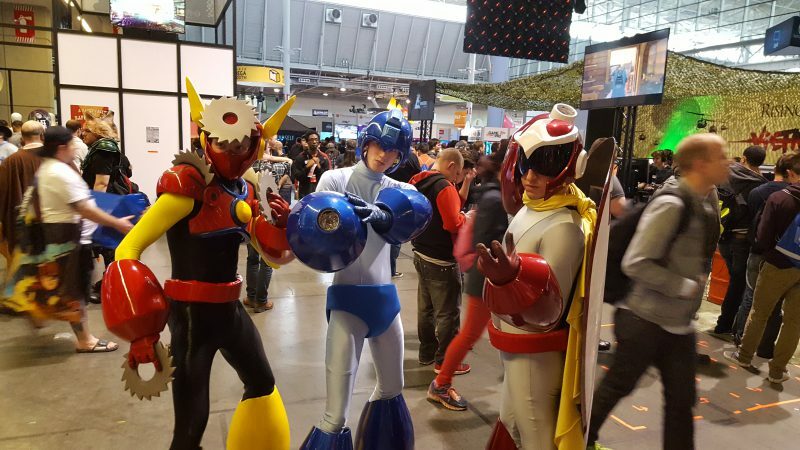 I know I’m a little late on writing this up–the days following the expo were a little crazy–but I wanted to share my experiences at my first gaming convention, PAX East. I’ve been watching shows like E3 and PAX from the outside for years, and I’ve always wanted to go, but have never had the opportunity. Then some friends, veteran PAXgoers, offered us a couple of their tickets, and I knew I had to go. To me, PAX was two distinct experiences: The claustrophobic-yet-exciting expo floor with all of its developers and vendors vying for your attention, and the more passive and interesting panels. Today I’d like to highlight a few of my personal favorite things from the expo floor. I’ll talk about my favorite panels in the coming days. I feel a little bit bad about my choices (only a little bit), because the show was really stolen by shooters like Overwatch and MOBAs like League of Legends, but those aren’t really my thing. But hey, this is my blog; I can write about whatever I want, right? Without further ado, here is my list. If you haven’t played Runic Games’ excellent Diablo-like Torchlight II, stop what you’re doing and go grab it. It’s probably my post played game on Steam, and the community has come up with some very well done mods. So when I heard that Runic was working on a new game called Hob, and that it was going to be at PAX, I had to check it out. I got to play a demo at their booth, and, while it had a uniquely Runic feel to it, the gameplay was much different from Torchlight, in all the right ways. From what I can tell, it’s more like Zelda than Diablo, with a bit of Metroid thrown in. It sports linear (presumably non-random) maps with a lot of smooth platforming, and item upgrades as you go rather than the levels, skills points, gear drops, and totally flat maps you’d associate with Diablo-likes. One such upgrade was the grappling hook, which had a very Metroid look and feel to it. They did a good job of using the grappler in creative and interesting ways, both as a means of puzzle solving and as a part of boss fights. Overall it had a great atmosphere and the quality gameplay I’d expect from Runic, and I’m excited to get to play more of it when it launches. Sadly, the guys at the booth didn’t have a launch target date. Incidentally, I inquired about the promised Torchlight Mobile, and they said it’s still in development, also without a launch date. To me, the fact that this indie studio is supposedly working on two different games at once means that Torchlight Mobile is either nearly finished or nearly abandoned. Hopefully it’s the former, because, while the Play Store has a variety of action RPG titles, none of them compare to the quality of the Torchlight series. If you’re a Mega Man fan, you can already guess what this game is. For those not in the know, 20XX is the ambiguous year(s) in which the Mega Man and Mega Man X games take place. Basically, 20XX is a faithful recreation of the best thing about the Mega Man X games, with a uniquely indie spin, even down to the choice of two playable characters, who play like X and Zero, respectively. The levels are randomized, so things are a little different every playthrough. Rather than the “Eight bosses in any order” model of the Mega Man games, 20XX takes an arcade approach–think Rogue Legacy or some of the other roguelite games we’ve seen in recent years–with the player trying to get through as many levels as they can before running out of health. Constant references to geek, gaming, and popular culture make the game extra entertaining. I got a chance to talk with both the programmer and the artist (who, as far as I can tell, comprise the entire team, which, as a member of a two man game dev team myself, is very encouraging), and they were both cool guys who seemed passionate about their game. They told me they are trying to learn from the mistakes and disappointments of certain other Mega Man-like games (I can’t imagine what they were talking about) who overpromised on their feature set and didn’t listen to their community early enough in the development process. As far as I can tell, they’re doing a great job so far. The graphics in 20XX aren’t going to win any awards, but they’re far from painful to look at (which, to be honest, is all I’m really looking for when I play a 2D platformer, especially an indie one), and the music is perfect for an indie Mega Man-ish game. I’ve already spent several hours in the game, and it’s exactly what I was hoping it would be. You can get it now on Steam Early Access. The devs tell me that the price will only continue to go up as the game develops, with a final cost around $15, so picking it up sooner rather than later seems like a good idea. Speaking of Mega Man, I couldn’t help but share this awesome Mega Man group cosplay, which was by far my favorite cosplay at PAX. I didn’t get it in this picture, but their buster guns even lit up! From what I saw, Pokemon trainers were by far the most popular cosplay this year, outnumbering the ever-present Links and Vault Dwellers. I also saw a really impressive Sith Twi’lek couple, but sadly didn’t get a picture. I was surprised to see a number of oldschool RuneScape cosplayers, though I guess a paper crown and a cardboard anti-dragon shield isn’t exactly the most involved or expensive cosplay out there. Sadly there wasn’t much MMO presence on the floor this year, and the ones that were there were games I’m not as interested in (like Final Fantasy XIV), but that’s likely due to the fact that there aren’t many new MMOs on the horizon right now. There was still a lot to see and do, and plenty I never got to. PAX East 2016 was my first gaming convention, and if it’s the only one I ever get to go to, I’ll be satisfied. I’d love to make it an annual thing, but realistically it may not be possible for a while, and that’s ok.
Be sure to check back soon for part two, where I’ll talk about some of my favorite panels!